This weekend we are in Los Angeles for a wedding and to visit family. It is so hot, but I sort of miss this “real” summer weather since in San Francisco it never gets hot. Speaking of summer, don’t you just love all of the fresh summer vegetables? 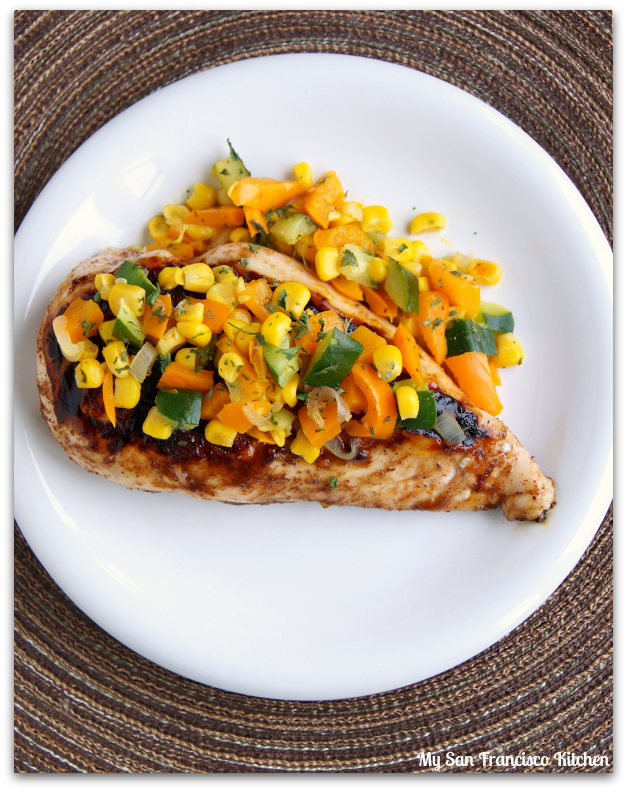 I found this great recipe on Cooking Light for a simple mixed summer vegetable side that went great with this apricot-glazed grilled chicken. This healthy dish is so easy to make, especially on busy week night! The vegetables are just cooked with a little olive oil and do not need much seasoning – their flavors really come out and mix very well together once simmered in a cast iron skillet. You can add jalapeño for a spicy twist, and make a vegetable salsa! Skip the carbs, or serve with scalloped potatoes for complete dinner meal. Heat oil in a cast iron skillet on medium heat, then add chopped vegetables (except for the shallots). Cover and cook for 5 minutes, stirring occasionally. Remove from heat at stir in the shallots. Set aside and keep warm. 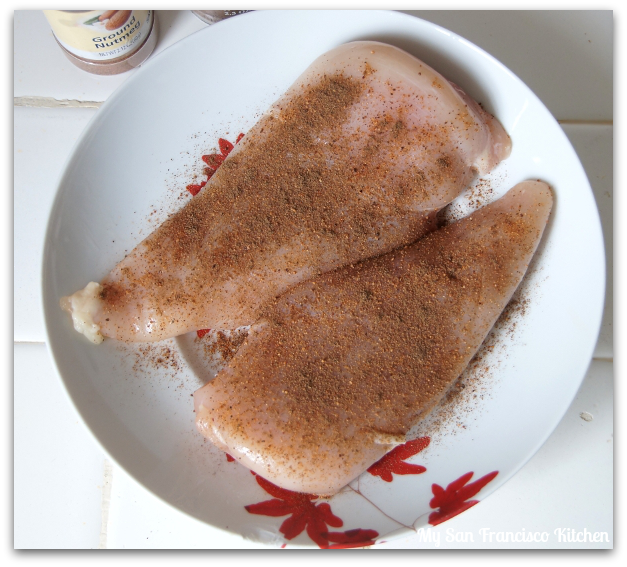 Sprinkle chicken breasts with paprika, all spice and nutmeg, then rub all over. Grill for about 7 minutes to internal temperature of 165 degrees F, moving position occasionally. Continue to spread apricot preserves over the chicken to glaze occasionally. Garnish vegetables with parsley and serve over the chicken. Charred Summer Vegetable Recipe adapted from Cooking Light. This entry was posted in Dinner, Lunch and tagged apricots, chicken, grilled, healthy, vegetables. ← Top Chef Heather Terhune & Chicago Cutlery Giveaway! Delish! I can always count on you to post an amazing looking, healthy dish. Hope you had a fun time at the wedding!